On Day one of the NACB finals at Pennypack Park in Philadelphia conditions were warm and the fields were in good shape. There were 6 teams from the Northeast division in action and five came through their early round games. Fr. Tom’s junior hurlers defeated Vancouver comfortably with some good performances from Tadgh O’Huallachain, James Dooley, Kevin Mooney, and James McGrath and ran out 2-28 to 2-7 winners. The Cork junior footballers had to work a bit harder in their quarter final against Atlanta. Holding a comfortable lead at the break, Cork fell behind and with 6 minutes left trailed by a point. Lar Barden and Paddy Ryan swung the game with a goal each and the rebels ended up 7 point winners. Donegal took extra time to beat Young Irelands Philadelphia in the junior A competition, a trophy that has proven to be very hard for a Northeast team to win. Donegal will meet Padraig Pearses from Chicago tomorrow. The Shannon Blues also played the host team, St. Patricks, in the senior quarter finals and came through to meet Vancouver in tomorrow’s semi-final. The junior C hurlers had a mixed bag. The Barley House Wolves played two games and came through both with a bit to spare. First against Denver and then a Southeast team that entered the competition. BHW will face St. Louis tomorrow, the team that pipped them in last year’s final. Portland went down to Indianapolis and will enter the shield competition. The stands and sidelines were bursting with anticipation for the senior football final between Shannon Blues and Donegal and the punters were not disappointed by the classic game of football served up by the two top teams in Boston this year. Donegal looked to have the game in the bag with a five point lead and three minutes left. The Donegal crowd was singing in the stand, but the Blues forced extra time thanks to a Kieran Hurley goal and two Sean O’Connor points. At the break in extra time the northerners again led, this time by three but back to back goals by the never say die Blues catapulted them into a lead. The Blues slowed it down in the last few minutes of extra time, and got two insurance points, to win the 2012 senior football championship in amazing style. A goal separated the sides at the end of the first 30 minutes, though it could have been more. Donegal missed a penalty early in the half after Fergal Clancy was pulled down in the area. Brian White went low for the corner and ball rolled wide of the post. The Blues tried to get their quick handpassing game going and had a degree of success. Sean O’Connor put two well worked points over the bar, James Hynes two, and Caolan Rafferty one that came from running moves that the Blues managed to craft. Donegal had the upper hand though, especially in the middle of the field. Clancy was in great form at wing forward and at times opened up the Blue rearguard. Conor Phelan did well at corner back to recover several balls, and Thomas Sayers made three very good saves when a goal beckoned for the northerners. Dessie Dolan was on form putting three points over, two from frees while Derek Maguire also found the mark on two occasions. Donegal’s goal came from a typical defence splitting move. Kieran Williams found White who was steaming down the middle and the Louthman’s shot gave Sayers no chance. At the break Donegal were a goal to the good. The excitement level rose considerably in the second half. Donegal stretched their lead to five points and were on top of the Blues short kickouts. One score came straight from a short one that was returned over the bar by Kevin Mulhern. The Blues kept up their running game but when it was critical to hold on to the ball, the Blues spilled it at crucial moments. James Hynes netted to bring the Blues within two points and Cathal McHugh pointed to make it a one point game. The Blues then had several chances to take the lead but chance after chance went awry as the forwards lost their touch. Donegal made the Blues pay for their errors. With less then 10 minutes to go Donegal turned a one point lead into five. Donnelly, White, Maguire and Kelly each put fine points over the bar and it looked as the game was Donegal’s. Driven forward by captain Brian Curran, the Blues earned a last chance to win the game with a few minutes left. Peter Boyle made a great save from Caolan Rafferty from point blank range but the ball spilled to Hurley who pulled on it and into the net. Sean O’Connor put two points over the bar, one from a free to level it, and unbelieveably extra time was now necessary to separate the teams. Donegal got off two quick points to get extra time going. The Kickouts favoured Donegal who ran the ball at the Blues back line. Dolan curled over a beauty and Kelly followed with another. Dolan and Cassidy put two more over as the Blues found themselves under pressure in the early going. O’Connor pointed once for the Blues before the break in play. Could the Blues keep the running game up enough to pull off a win? The answer was a yes. Two goals, both characteristic of the Blues handpasssing game carved open the Donegal defence. Cathal Cregg fired home to draw the teams level and shortly afterwards Rafferty buried a spectacular shot to the far side after begin fed by O’Connor. The goal stunned Donegal who were now all at sea and the northerners failed to score in the second period of extra time. Cregg now went into holding mode and used up time before pointing and then Brian Curran put another over the seal the victory. Delight for the Blues which surely more than made up for a tough season last year. Good luck in Philly! Man of the Match: Brian Curran (Shannon Blues) The Blues captain kept the side going when the chips were down. Donegal: P. Boyle, D. Reynolds, M. Canny, K. Mulhern, G. Reynolds, K. Cassidy, B. Donnelly, B. White, F. Clancy, D. Dolan, E. Kelly, K. Williams, D. Maguire. Blues: T. Sayers, C. Phelan, R. O’Callaghan, B. Curran, M. McGowan, S. Moriarty, D. Clark, D. Dineen, C. Cregg, J. Hynes, S. O’Connor, C. Rafferty, K. Hurley. It was a fantastic senior hurling final at the Irish Cultural Center in Canton on Sunday afternoon. Maybe not quite David and Goliath, but Galway were the team with the stars while Wexford were definite underdogs. For much of the game it was Galway who looked fitter, sharper, and more certain of their abilities. Wexford had the fire in the belly though, and two second half goals that could not have contrasted more in nature, delivered the game. Michael Moloney netted as good a goal as you will ever see, and on the 60th minute Paudie Kehoe mis-hit a long range free that traveled into the back of the Galway net to put the side two points to the good. Galway threatened to run away with it in the first 20 minutes as Wexford struggled to settle down. The underdogs seemed a little anxious and made uncharacteristic mistakes. Galway on the other had were running very smoothly. Liam Rushe started on the half forward line and looked much more comfortable then in his first outing almost a month ago. Points flew over the bar from all distances and angles for Galway. Eoin Guinan, Kevin Canty, Cian McBride, and Rushe had Galway in a six points to one lead before the game was 10 minutes old. It took a couple of Paudie Kehoe points from frees to settleWexford and the Slaneysiders remained in the contest. Two Galway points were exquisite in nature, and Rushe was involved in both. The first was from the middle of the field after Rushe won the ball on the sideline and the second came from a cleanly fielded ball by the Dubliner, who handpassed to fellow countyman McBride and the ball went between the posts. At the break it was Galway five points to the good, and looking very much in control. Wexford started the second half with a bang. After Eoghan Kavanagh pointed Michael Moloney netted to make it a one point game. Again Galway took control as it seemed they could whenever they wanted to, and the points flew over the bar. Guinan, Rushe, and John Moylan restored the lead to six points. Moloney struck again with the best goal that Canton has seen in many years. The ball found the Kilkenny man on the 14 at a tight angle and Moloney took one touch off the hurl and swung to fire the ball into the far corner. Wexford were still a goal behind but the score garnered belief. After Kavanagh followed with a point the game was anybody’s. The sides traded points until there was five minutes left. With Galway leading by a point a goal almost came for the tribesmen. Spruhan saved a goalbound shot and Kevin Canty pulled on the rebound and over the bar it went. Then came the dramatic finish that always seemed to be on the cards. Kavanagh first had a half chance from a breaking ball, and sent it over the bar after pulling on it. The Wexford’s third goal came and it sent the supporters into delirium. Paudie Kehoe’s free from the 65 was hit low and looked like it would be dealt with easily, but it did not seem to get a touch before landing in the back of the net. Wexford up by two now – a dangerous lead. Gearoid O’Connor, who missed almost the entire season due to injury had the final say with a point from play. Victory was particularly sweet for Wexford who had some things not got their way over the season. Perhaps this year will deliver a North American Senior Championship to go with the junior from 2011. If I were to hazard a guess, there will surely have been a rendition or two of the Transit Van before the night is out. Man of the Match: Michael Moloney (Wexford) Moloney’s amazing goal gave Wexford the lift to keep Wexford going till the end. Wexford: E. Spuhan, M. Walsh, D. Redmond, B. O’Connor, P. Nolan, B. Dalton, P. Coady, J. O’Neill, J. Kehoe, E. Kavanagh, P. Kehoe, K. Sheerin, M. Moloney. Galway: M. Mulrooney, D. Shaw, C. Murphy, B. Watkins, S. Nolan, S. Corry, C. McBride, B. McNamara, L. Rushe, K. Canty, S. Brown, E. Guinan, J. Moylan. Connacht Ladies First Season Delivers the Cup. 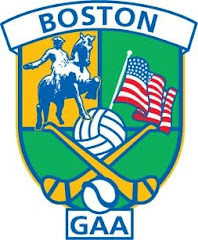 Connacht Ladies took the Boston senior championship on their first attempt with a rousing victory over the Boston Shamrocks. Connacht got great performances from Louise Ryan and Imelda McNulty in the half back line, Christina Newton in the middle of the field, and a superb game from Jane Ward at full forward. When the game was on the line Ward was involved in helping out the back line and as usual caused havoc in the Shamrocks rearguard all day long. Boston Shamrocks started the game without the services of Orla Heavey and Mary Cronin, who had been key pieces of their season, but still had plenty of talent to give a good tilt at the game. Connacht Ladies got off to the better start. With Imelda McNulty, Brett, and the full forward line clicking, Connacht established a six point lead. Ward was the main threat in the Connacht forward line, and netted mid way through the half. Her low shot beat the keeper on the inside post. Connacht had popped over from Ward, Sinead Ryan, and Louise Brett and looked in well control leading by 1-5 to 0-2. The Shamrocks struggled to keep pace with their opponents, but a goal from a Clodagh McGovern after the bounce of the ball beat the defender kept them in touch. Katie Scanlon was pulled down in the area and Sheila Carroll slotted the spot kick home. Game on again. Connacht took a two point lead into the break thanks to points from Ward and Anne Marie McDaid before the short whistle. With the second half 10 minutes old the sides were tied as the Shamrocks pulled themselves level with points from Cronin and Clodagh McGovern. Ward, however, was involved in a goal that put the westerners ahead. Her deft chip over the top found Ryan who finished expertly into the far corner. Ward followed with a point and there was four points between the teams. Niamh Lonergan, who worked hard all afternoon on the wing pointed for the Shamrocks and Cronin reduced the deficit to two points. The Shamrocks pushed forward as the excitement built. After Louise Ryan pointed the Shamrocks got within a point thanks to scores from Ciara Hegarty and Cronin. It was anybody’s game now as each side pushed for the decisive scores. It was Connacht who got them. Ward, who was now also helping out the backs, set up a score for Brett and which proved to be the winning point. A championship for Connacht Ladies in their maiden season, and for the Shamrocks it was very much a comeback year. Player of the Game: Jane Ward (Connacht Ladies) The Tyrone girl was key for Connacht Ladies in the forward line. Shamrocks: L. Behan, S. McMahon, E. McGovern, A. Dillon, A.M. McDonnell, D. Hallissey, B. Gallagher, A. Smith, C. Hegarty, N. Lonergan, L. Cronin, S. McGovern, C. McGovern, S. Carroll, K. Scanlon. Connacht: C. Heraty, L. Burns, J. O’Connell, A. Kerr, L. Ryan, I. McNulty, M. Treanor, K. O’Shea, C. Newton, A.M. McDaid, L. Brett, K. Lynch, S. Ryan, J. Ward, J. McDonagh. Donegal came through in the final 10 minutes of the junior A football final to claim the title and the Pat Callaghan Cup from Wolfe Tones. Pat Callaghan was a stalwart for the GAA in Boston for years, and still helped out on the board well into his later years. It was fitting that the inaugural Pat Callaghan cup go to Donegal, for Pat was a Donegal man himself. Pat Callaghan Cup from Anne Callaghan. For most of the game it looked as if the Tones would have it as they led for 50 of the 60 minutes. After a player from each side was sent off, Donegal’s fitter legs carried the day. A goal from Michael McGinty and two late points from Rocky Ivors and Christy Bell put the cup into Donegal hands. There was very little between the teams in the opening period. Wolfe Tones got the scoring going with a point from Mick Sammon followed by a well taken Mike O’Brien point. Donegal were level shortly after. Rocky Ivors found Christy McLoughlin with a great ball and McLoughlin pointed. Kevin Curran then leveled affairs with a free. With the Tones half backs doing well, the South Boston team went on the three point spin. Joey Farrell pointed twice from play and Sammon once. Donegal fought back. Ivors and McGinty did well in the middle of the field. Two points from McLoughlin brought Donegal within a point at the break. The second half saw two sendings off. Kevin Gorham and Ciaran Flynn, who had just entered the fray, were shown red mid way through the half for striking The Tones had added to their lead. Marty McGeough had entered the game at corner forward and the Tones picked off four unanswered points. Sammon, Keelan, O’Brien and McGeough were the scorers. Donegal were not having much success in their efforts until Kevin Curran pointed a free 17 minutes into the half, and Paddy McMyler put over another from play. With three points in it veteran Michael McGinty netted from inside the 14. McMyler found Rocky Ivors for the go ahead point and all in the space of 5 minutes Donegal were ahead. The Tones lost another man to a red card. Ed Carr and McMyler were involved in a scuffle. McMyler was shown a yellow and Carr a red and now it was 11 versus 12 for the last few minutes. The Tones had it all to do now and with a couple of minutes left on the clock there was a chance. The champions put all their efforts into turning the game, but Christy Bell put two points in it. The Tones still had time to steal it and had futile claims for a late penalty as Keelan went down in a crowded penalty area but at that point in the game a penalty claim would have to have been explicitly clear. Keelan pointed from the sideline to bring it to a point, but it was Donegal who won the next kickout and the final whistle went. Delight for the Donegal juniors who dedicated the season to former player, the late Thomas Maguire of Ardara. Donegal: J. Byrne, P. McNulty, D. McBride, P. McLoughlin, E. Doonan, D. Doherty, C. Bell, M. McGinty, R. Ivors, K. Curran, P. McMyler, C. McLoughlin, D. Green. Wolfe Tones: B. Murray, K. Gorham, K. Gill, M. O’Brien, C. Davy, E. Carr, J. Farrell, K. Keelan, G. Walsh, G. Molloy, S. Kelly, M. Sammon, J. Carroll. Schedule - Playoffs and Final - Update! Senior Football: Tones secure third place.